*This item ships directly from Sleeping Bear Gallery. 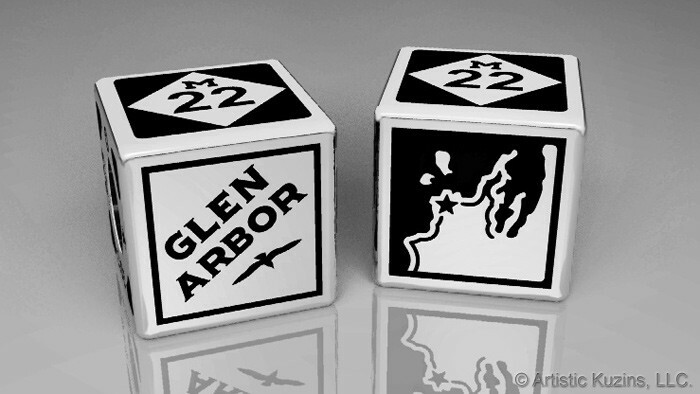 Our exclusive line of Up North Destination Beads depict your favorite town along Michigan’s M-22 Interstate Highway. Every sterling silver bead is handmade in Michigan and displays detailed craftsmanship on each of it’s four sides. One side displays your favorite town! The opposite side features a star indicating your favorite town’s destination on the map! Artistic Kuzins, LLC has committed to donating $1 to a worthy cause within each community’s bead sold and Sleeping Bear Gallery has too! That means; $2 from the sale of each community’s bead will help make a difference in their area ! Empire’s, Glen Lake’s, and Glen Arbor’s goes to Empire Area Community Center’s Emergency Fund. Place your orders early for holiday gift giving! Note: Ads in Traverse Magazine & MyNorth Wedding incorrectly say these beads are sold in sets of two; they are sold individually for $95. We apologize for any inconvenience.